The best Shakshuka recipe is here, guys! 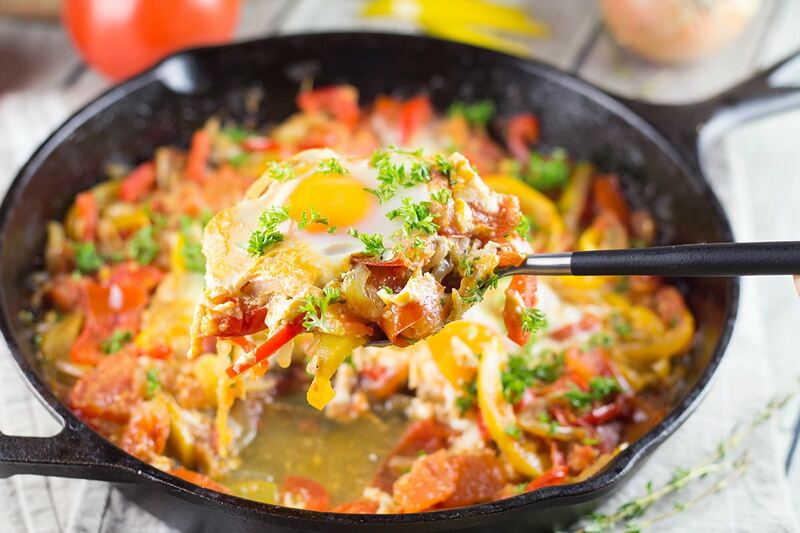 If you still haven’t tried this North African creation, it’s about time because it’s one of the most awesome breakfast egg dishes ever! There are dishes that I enjoy regularly, but they are still not on the blog yet. Why so, you may ask. Well, some of them are so popular that almost every single blogger out there made their version and I feel that I have nothing to add. It looks like those dishes are all over Pinterest and there is that feeling that no one will notice another post on the same topic. But today I thought; who cares if it won’t get the attention it deserves on Pinterest? In the end of the day, the most important thing is my readers. 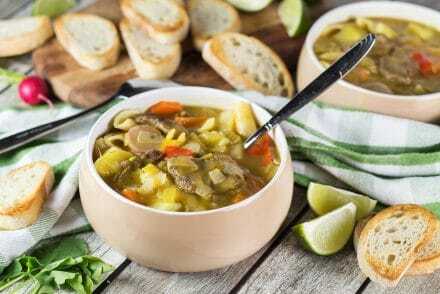 Why shouldn’t I share a recipe if I know that it’s outstanding and that my readers will enjoy it? Moreover, it’s strange to keep making a dish every single week and not recommend a recipe to you, guys. Ok, enough words, let’s cook one of my favorite breakfasts ever! There are dozens of ways of cooking eggs, but Shakshuka is undoubtedly one of the best and most popular ones. It’s a staple of many countries all around the world. Wikipedia says that it’s enjoyed in Tunisia, Libya, Algeria, Morocco, Egypt, and Israel. I always thought that Shakshuka was born in Israel, but it seems that these eggs in tomato sauce were simply introduced by Jews, but not necessarily the ones living in Israel. In fact, such a country as Israel hadn’t even existed when Shakshuka was invented. It would be more accurate to say that it’s a North African dish. So what it’s all about? 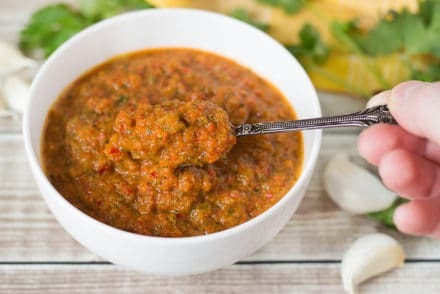 First, we make a fragrant tomato and bell pepper based sauce, with the aromas of onion, thyme, parsley, and cilantro. When the sauce is ready, we gently cook eggs in it. Sprinkle with some more cilantro or parsley and that’s it! You can begin savoring this fantastic creation and praising it. Yes, you WILL praise it. I am one hundred percent sure because this Shakshuka is crazy good. The tomato and bell pepper sauce is the thing that makes this dish stand out. 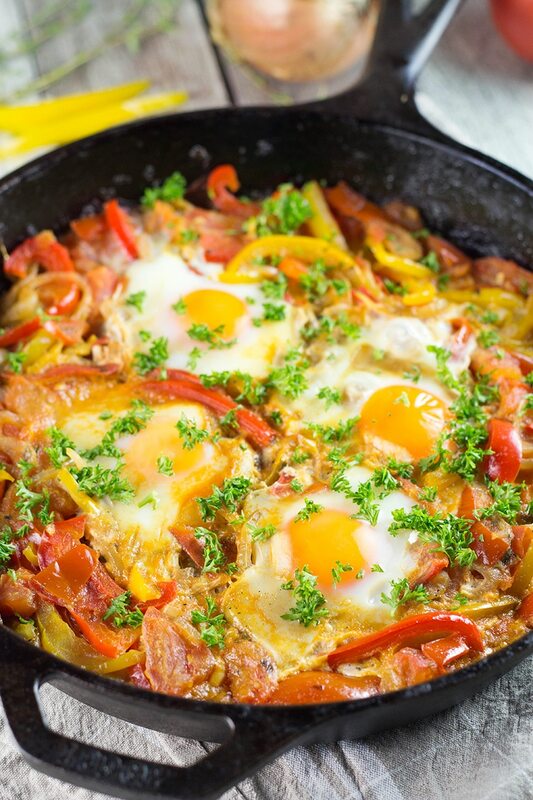 It goes so well with the eggs, creating a feast of flavors in your mouth! It’s really hard to explain how good this North African dish is. You will have to try it yourself to truly understand the magic behind it! 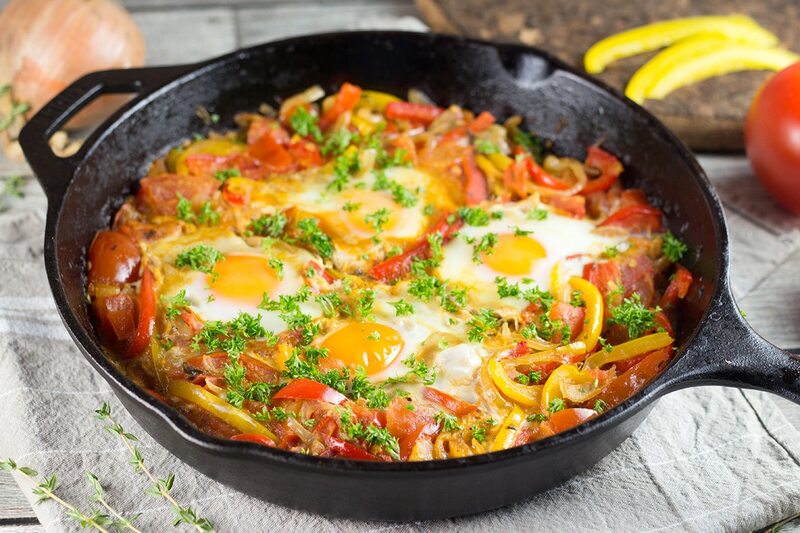 This North African dish features eggs fried in a spiced tomato and bell pepper sauce. The best breakfast egg dish ever! In a pan, on high heat, dry roast the cumin seeds for a couple of minutes. Add the oil and onion and cook for 5 minutes. Add the bell peppers, sugar, bay leaf, thyme, parsley, and cilantro and cook for 5-10 minutes more. Now add the tomatoes, cayenne, salt, and pepper. Reduce the heat to low and cook for 15 minutes. During the process, keep adding the water to get a pasta sauce consistency. Remove the bay leaf. Make 4 gaps in the tomato and pepper mixture and break an egg into each gap. Sprinkle with some salt and cook, covered, on a very low heat, for 10-12 minutes, until the eggs are just cooked. Garnish with some parsley or cilantro. Enjoy! Your photos are beautiful! And I love the idea of adding red peppers – something I need to try! I love shakshuka and it’s become really popular here in last few years. Lovely dish to make at home too! Yeah, but I can understand the popularity. It’s freaking awesome! This looks like a delicious breakfast treat. Thanks for the kind words, Silvia! LOVE! And such mouthwatering photos. I sometimes feel the same way about posting recipes that already oversaturate the web, but like you said, it’s your readers that matter. 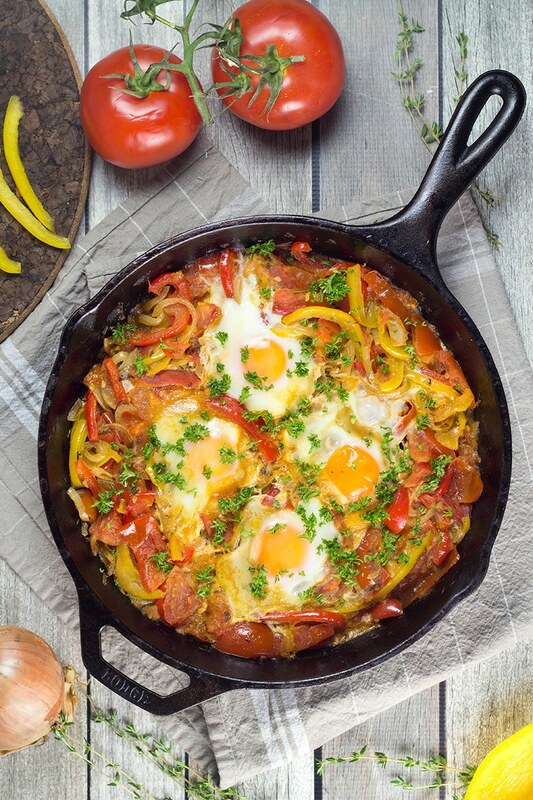 I LOVE a great Shakshuka recipe and this one looks like absolute perfection!! Can’t wait to dig in! This looks awesome. I could eat this for breakfast, brunch, lunch or even dinner. So much flavour…perfect for entertaining too. Gloria, the same here. I don’t need anything else, just give me Shakshuka any time of the day! This sounds like an amazing dish! I know the hubby would enjoy it!! I bet he would. Everyone loves Shakshuka! This reminds me of a Mexican dish. Looks a fab dish for breakfast or lunch especially. Wonderfully tasty & healthy. This would make a perfect Sunday AM breakfast Thanks. Yup! I always make Shakshuka on weekends, because there is not enough time to cook it on weekday mornings. Ah, I wish it would be! 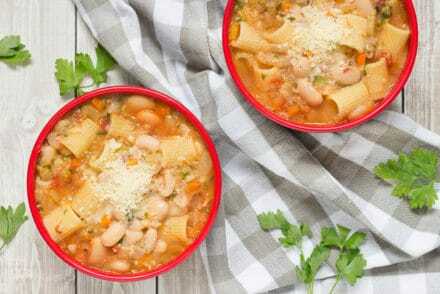 I’m so glad I decided to come visit your blog as and that you decided to post this outstanding recipe! 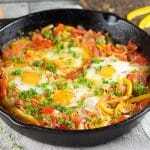 Shakshuka is a fav of mine and I’ve tried it many ways but not quite like this! So loving the bay leaf/thyme flavor combo (never tried that in a shakshuka and now I must). Hope your weekend is wonderful and thanks for visit my blog. Thank YOU for the kind words, Shashi! Love your blog! I love how many vegetables are in this. I’m always try to start my day with as many veggies as possible so I love recipes like this! That’s right. Sometimes people forget that veggies are crucial for our health. WOW does this look good, I love to eat eggs for dinner after a busy day and I’m definitely going to try these this week, thanks! This looks amazing- I have been wanting to try this dish but never have gotten around to it. Pinning this for later!